I have never been a breakfast for dinner kind of person. When I was a kid and they served breakfast for lunch at school, I would be really disappointed. To this day, I'm still a bit uptight and overprotective about my meals. Breakfast is breakfast, and it should consist only of breakfast-type foods (IMHO). Lunch is lunch-type foods (salad, soup), and dinner is my most sacred meal. I think one of the reasons I don't like breakfast for dinner is because I don't really have a sweet tooth, so the thought of eating a breakfast-type food that is on the sweeter side, such as a stack of pancakes or waffles, for dinner (the sacred meal, remember) is a huge turnoff. However, if you offer me a savory breakfast option for dinner…then, mayyybe then, we can talk. Especially if they are in the form of a waffle. Photo: Courtesy of What's Cooking Good Looking. 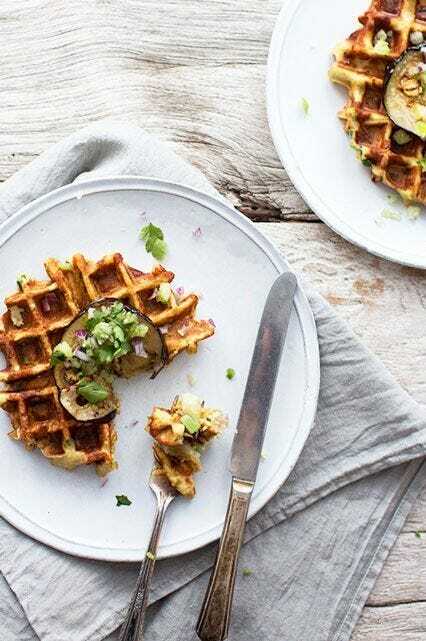 These savory waffles might be the first — and only — breakfast-type food that I can get behind come dinner. The parsnip gives these waffles a savory, earthy, zing that's a bit unexpected. The eggplant and the salsa turn this dish into a meal that could totally cross the lines between breakfast, brunch, lunch, and dinner. Simply put: These waffles are fantastic. Once all of your ingredients are chopped, place them in one big pile on the cutting board and give them one more good chop while the are all mixed together. Then, place the salsa in a small bowl, season with salt and pepper, and refrigerate until you're ready to serve. In a cast iron pan, heat up 1 tablespoon of the olive oil over medium heat and add the shallots. Cook for 1-2 minutes, or until they are soft. Add the garlic, stir, and then add turnips, salt, and pepper. Sauté the parsnips until they are soft, about 5-7 minutes. Transfer the parsnip sauté to a blender or food processor, add the water, and blend on high until you have a smooth puree. Transfer the mixture to a bowl, refrigerate for about 10 minutes to allow it to cool (especially before adding the egg, because if it is too hot, it will cook the egg). Pre-heat the oven to 200°F. Drizzle the olive oil (lightly) over the eggplant slices and season with salt and pepper. Heat the same cast iron pan on medium heat, add the eggplant, and cook for about 3 minutes on each side. Cook 3-4 slices at a time, depending on the size of your pan, until all of the eggplant is cooked. Transfer the cooked slices to a baking sheet and place them in the oven to keep warm while you finish preparing the waffles. 1. Remove the parsnip puree from the fridge, and stir in the beaten egg and the remaining 2 tablespoons of olive oil. Make a well in the center, add in the flour and baking powder. Stir until everything is combined. Lastly, fold in the chives. 2. Heat a waffle maker to a medium-high setting. I find that with this waffle batter, you want to err on the side of crisper waffles, so you want a higher heat setting. 3. Cook the waffle accordingly to your specific waffle maker's instructions. 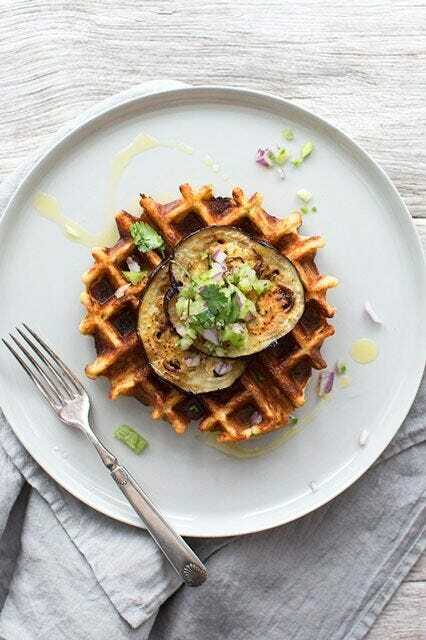 Carefully remove the waffle, place on a baking sheet and transfer to the oven (that was pre-heated for the eggplant) if you want to keep them warm. Do not stack the waffles and do not place them on foil, because they will become soggy. When you've cooked up all of the batter, assemble the waffles. Place a single waffle on a plate. Add 1-2 slices of the eggplant, and finish with a large spoonful of the salsa verde. I also like to finish with a drizzle of really good olive oil and some fresh cracked pepper. If you want to save the waffles for later, they keep really well wrapped up in the freezer. Cover them in parchment, then in foil, and then place in a freezer bag. To heat up, you can heat them in the oven at 350°F or toast them on a cast iron skillet.